* MERCURY RETRO in VIRGO Opp. CHIRON in PI: Count the Sunny Hours, and Count Your Blessings – Very Healing! Mercurial Greetings, dear Astro~News Fan! Have you been going a bit (or very much) mental, these days and weeks? Welcome to humanity – under the influence of the present AstroSphere, feat. a SUPER MERCURY (‘blown up’ by JUPITER) in VIRGO – one of its home signs. Plus: several ‘helpings’ of VIRGO fare (SUN, MERCURY, VENUS, North Node, and JUPITER)…! Makes you a bit nervous, just to think about it? Can’t figure out how to resolve those issues…? What’s the ‘right’ way of dealing with…? Let’s just relax for now. Don’t worry, we’re all in one boat – and hey? What boat? What’s ‘real’? It’s all ‘just’ phenomenal (says PISCES on the others side of the spectrum, with NEPTUNE, South Node, and CHIRON these days / months / years), and let’s trust the HEART journey (says SAG, with MARS / SATURN nowadays)! Lots of ‘moving parts’; things change a lot (mirrored by lots of mutability in the astrological weather patterns). MERCURY is about to go RETRO – today Tue Aug 30 (you might read this message when Mercury already is retro – from 6:04 am PDT on! ), until Sept 21. Indeed: The winged messenger MERCURY will technically / ‘officially’ turn retro – from Earth perspective…. in late VIRGO, tomorrow! Time to sloooow the busy mind down, and enjoy the magical, synchronistic ways of how nature and life speak to us – when we really look and listen, learn, and flexibly adapt and flow. RE-establish inner priorities (rather than going after status and control) – CAP (next one). What a Super VIRGO time it’s been recently, and over the last year! … with MERCURY (since July 30! ), VENUS (was in VIR since Aug 6 – entered LIBRA this evening! ), the SUN (since Aug 22, seasonally), the Lunar North Node (since Oct 2015 until May 2017) –Nodes show Eclipse seasons (in VIR and PI), and JUPITER (since Aug 2015 – until Sept 9 / next week)! SO much to do, to take care of… so many issues that require help and re-alignment, i.o.w. where things are ‘messed up’ we can offer help, and when necessary help ourselves ‘bring order into chaos’ (one of VIRGO’s mantras), and lending a helping hand and a smart brain (both mind and hands are in fact ruled by VIRGO – as well as small intestines, as in: sorting things out). Yep, MERCURY – winged Messenger Archetype, and in Astrology representing the Mind and its workings, has been in its pre-retro stationary (slow turnaround) ‘storm’ over the last week! The immanent early M-r phase in VIRGO shows us ‘old stories’ of how the mind can try to ‘organize’ life. Which has gotten wayyy ahead of SPIRIT and consciousness (the SUN), and needs to be ‘lassoed in’ to follow as a tool, rather than taking the lead. This is the main function of M-r.
See you Hope to SEE you again soon, in real life, or on Skype – it’s all about REconnecting (as directly as possible)! MERCURY, now at the very end of VIRGO (29°04′) is about to go RETRO this morning Tue Aug 30 at 6:04 am PDT. That’s what this ar-tickle is all about. I bet you’ve been tickled and RE-mind-ed of all sorts of things lately. The late VIR zodiac zone has also a VIR undertone… so much to do as it seems – what is in true ALIGNMENT though? The pre-retro stationary ‘storm’ has been on since MERCURY significantly slowed down its speed = since Aug 22 – see previous Astro~News). Have you noticed a shift in your mind since last week, towards slowing down, and a call for more groundedness? After Mercury will be direct again from Sept 21 on (= after the Fall Equinox on Sept 22), there will be another post-retro ‘storm’ until Sept 25. All in perfect alignment with the cosmic dance, and the ‘cosmic smile’. Seems like the universe smiles at us when we recognize a synchronicity! J.
Don’t get annoyed when the ‘cosmic prankster’ plays tricks on your perhaps uptight mind (VIR shadow) It wants you to be FREE from analysis paralysis and FREE for…???! Count the Sunny Hours, and Count Your Blessings – Very Healing! Sloooowing down, tuning into the Body and its messages, maybe literally our intestines – how do we digest experiences? (related to the VIRGO theme). Rather than going crazy busy about the ‘to-do list’, asking ourselves: What helps in this situation??? Maybe we need to take ourselves to magical spots. Mercury is also the magician, and, esp. with its VIRGO rulership, rules ‘practical magic’ – tools and physical places that transform, re-align, help, and heal. Ceremony is perfect under M-r in VIR, esp. for a release of old thought forms. Specifically before the New Moon – before Sept 1 would be great cosmic timing. The mind in VIR mode tries to figure out, analyze, and ‘fix’ a situation. Not everything is ‘figureout-able’! How about an organic and surrendered approach when intuition says: Go with the flow?! Definitely more magical, and open for the unknown and unknowable. Watch for analysis paralysis (JUPITER / MERCURY retro in VIR opp. CHIRON in PI). Dito – relax! Let’s follow the messages (MERCURY) of the Body (VIR). They might take you inward at first, esp. in the first half of the M-r phase (until Sept 12), to help us RE-align. On WED Sept 7, from 2:07 pm on. Experience your chart directly through the body (rather than via the head). Let the Archetypes speak to and through you. Experience the Archetypes in Astrology and perhaps your own chart in a new, fresh, embodied way. If you have questions, and / or you are interested in even having your chart embodied please feel free to contact me, and let’s talk. MERCURY retro likes that, rather than lots of back and forth texts and messages. To check your ‘invent-ory’ (in other words, ‘resources’ and inventive ideas that you may or may not have organized (VIR), and could come to new life…. – some of them are due for purging and RE-cycling too. A MERCURY retro question could be: Can we use the ancient labyrinth structure / system, to intentionally connect, energize, and regenerate both brain hemispheres, and everything ‘mind’? A VIR d.i.y. RE-alignment practice perhaps? I’m sure more ‘RE-medies’ and ‘practical magic’ will RE-veal themselves, under M-r in VIR. When we identify with the mind’s analyses, stories and assumptions, AND with our feelings, based on the thoughts that circulate in us (or vice versa, thoughts based on feelings) we are entangled in its own net, and far from free (the shadow of M-r in VIR opp. CHIRON in PI). Thinking itself is not the problem, and we can’t and don’t need to make our mind ‘shut up’. The issue is rather getting wrapped up with our thoughts, esp. with VIR which loves figuring things out. MERCURY retro in late VIR is super close to VENUS (now freshly in LI) and JUPITER in late VIR – all on the ‘Perfect Alignment’ Point. Rather than making a big fuzz about having things perfectly lined up, otherwise there’s a problem, let’s allow things to fall into place, and do our part, in a relaxed way. And to focus on our blessings rather than on our problems, worries, and concerns…! Let’s BE aware and MIND-ful, recognize when we are rather mind – full, and what it takes to bring more ease and flow to our life. 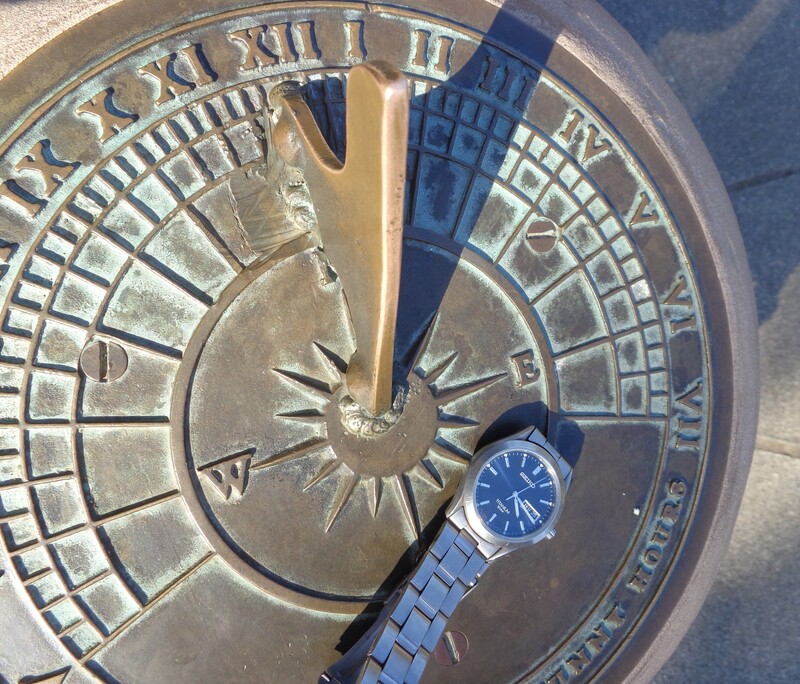 Like the Sun dial, let’s count the ‘SUN-ny hours’, and the blessings (rather than the ‘regular’ accounting and calculating overdrive). Let’s see what the * Sabian Symbol of the Mercury Turnaround Degree reveals. MERCURY will turn retro at 29° 04′ VIR. For the Sabian Symbol, I’d suggest to round it down to 29° VIR, since the direction is backwards. “A SEEKER AFTER OCCULT KNOWLEDGE IS RADING AN ANCIENT SCROLL WHICH ILLUMINES HIS MIND. Keynote: After a crisis one should seek to re-align the re-newed consciousness with the primordial re-velation of the Truth of Man. Any revolutionary movement, once it has succeeded in overcoming the inertia of the past and in toppling obsolete structures, needs to tap the most essential realities of what a human being represents and signifies in the universal Order; or else it merely re-embodies in a superficially altered manner the very things it has destroyed. This is the crucial moment. In occultism the ‘Pattern of Man’ is an archetypal power that may be contacted. It must be sought with undeviating determination. After each revolutionary crisis this pattern and this power can be contacted – always the same, yet at each new cycle perceivable in a new light. This symbol presents us with the technique required to ‘reach the other shore’. But each individual and each group must come in its own way to the ROOT KNOWLEDGE which provides the only safe foundation for rebirth”. Powerful, and definitely ‘retro’ message for the whole M-r phase – bringing the Mind back to SPIRIT / Consciousness. Mercury, Sculpture by A. Pajou (Louvre, Paris) – uuuh, temporarily grounded / lost his ankle wings. Aug 22: MERCURY in VIR entered the stationary ‘storm’, and was also conjunct JUPITER for the first time. Stormy, ingenuous, or wrapped up in details while attempting to walk the BIG maze / crop circle / Sacred Geometry of Life (all ruled by VIR)? Today Aug 30: MERCURY end of TAU will turn retro, from Earth perspective. Sept 2 – day after the Solar Eclipse in VIR: MERCURY retro meets JUPITER in VIR. Significant messages from within – the Inner Alignment Priestess is speaking. Sept 12: Inferior Conjunction of MERCURY retro with the VIR SUN. Sept 21: (Day before the Fall Equinox): MERCURY will go direct again. retro phase). We learned a big deal about the ‘operations’ of the mind – to be revealed until then. Sept 25: Mercury will leave the post-retro ‘storm’. Oct 7: Mercury direct in VIR will leave the post-retro ‘shadow’. Green light to be more clearly in our alignment and self awareness..